Last week I went to a friend’s house so our boys could enjoy an afternoon of airsoft in their huge yard. While the boys rode quads and shot at each other for hours, my friends and I gathered around a pot of this amazing soup. Every single person loved it and I knew it had to become a staple in our home! Luckily I have amazing friends who share their recipes with me so that I can share them with you! I adapted this a bit to use what I had in my house, so this is my version of her delicious soup. Saturday we had a Christmas lunch and I knew exactly what I was going to do with the leftovers. After all, I never ever let a turkey carcass go to waste. If you remember some of my soup posts in the past…turkey noodle soup, chicken pot pie soup, creamy wild rice soup….all of those can be made with turkey stock and leftover turkey! Here’s the beautiful, rich stock I got from a 12 pound turkey. I ended up with 20 cups which may have been too much for this soup, but I usually just wing it! That was my springboard for this recipe. However, my friend made hers with baked shredded chicken breast and prepared chicken stock and it was wonderful! 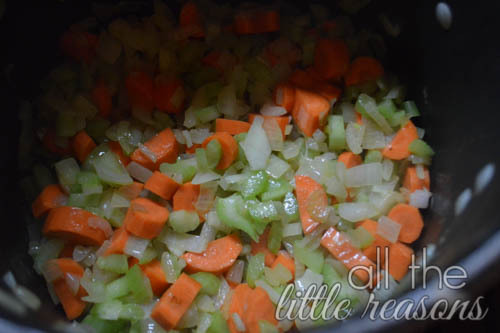 Start by sautéing onions, celery and carrots. Add the butter. Once it’s melted, add flour and cook for a minute or two. 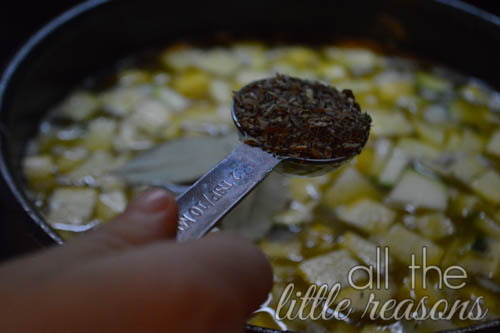 Add the chicken stock a little at a time, whisking it in as you go to thicken the soup. I was impatient and just dumped it in. Big mistake! Don’t do that. 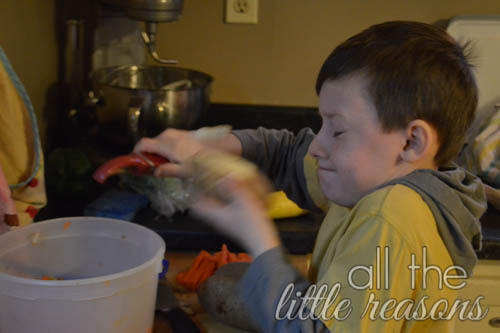 If you’ve got a cute helper who makes funny faces when he peels potatoes, it’s even better! 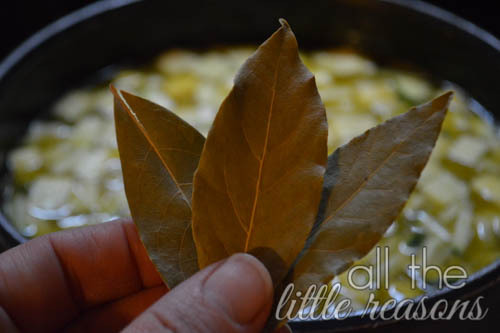 Add the basil and bay leaves and bring it to a low boil until the potatoes are cooked. 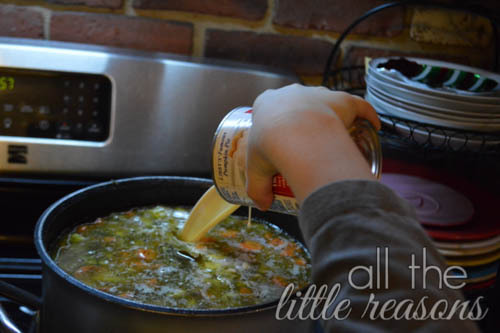 Add evaporated milk to make it creamy and salt to taste! If you’re using homemade stock, you will need quite a bit of salt. 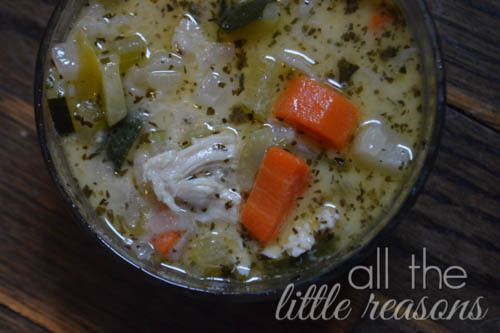 Add in any leftover shredded turkey you have to make this soup even hardier! 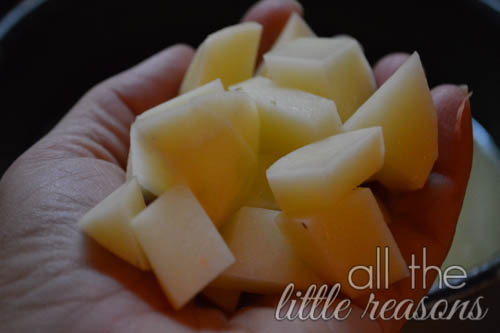 I hope your Christmas dinner goes a lot further with this tasty use of leftovers! *note – I felt like I would have wanted this soup thicker than I ended up with, so I doubled the butter/flour combo in the printable recipe. Also, I regret being lazy and not skimming the turkey stock to get the fat off. I ended up doing it later after I took pictures and skimmed off quite a bit of basil along with it. 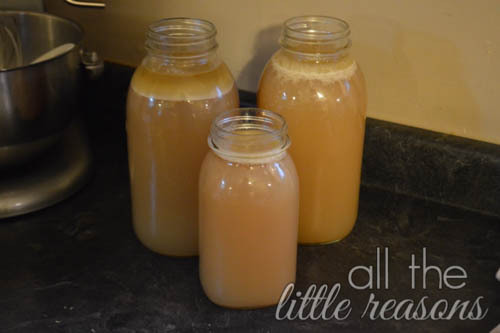 So don’t be lazy and skim your turkey stock. It takes a few minutes and is well worth the effort! Lastly, the original recipe calls for 6 large mushrooms, sliced. It was incredible and I wish I had them on hand. But since I had no intention of running to the store for 6 mushrooms, I omitted them. However, I would highly recommend using them. Add butter. When melted, add flour and cook 1-2 minutes. (skim fat off turkey stock first) Whisk in turkey stock a little at a time to work the flour mixture into it and thicken the stock. 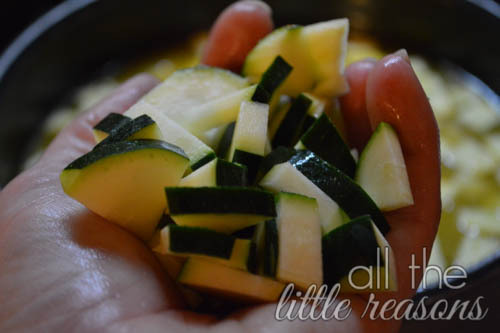 Add potatoes, zucchini, yellow squash, bay leaves and basil. Bring to low boil until potatoes are tender. 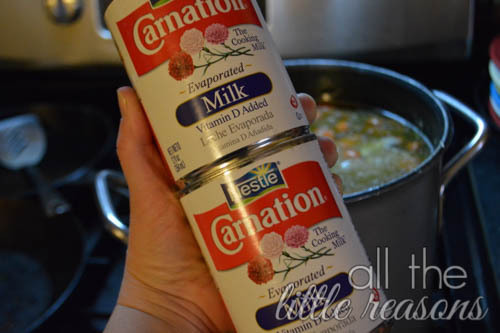 Add evaporated milk. Salt and pepper to taste. If using homemade turkey stock, it will need quite a bit of salt. 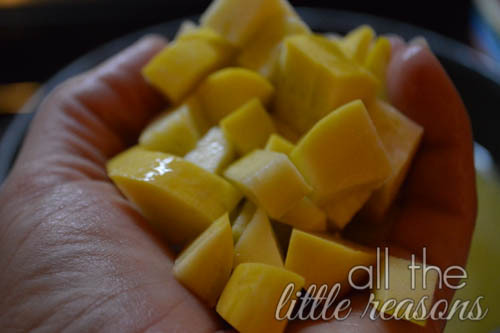 This is not necessary, but to make the soup even hardier, add in any leftover shredded turkey you have on hand. So good!